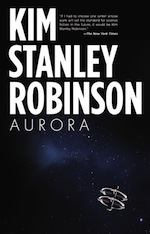 As 2015, the year of "AURORA", closes, Kim Stanley Robinson offers his reader a short story -- fully available at Tor.com here. "Oral Argument" is a transcript of a hearing at the US Supreme Court on patent laws that allows us to get a glimpse of a very green future. This is one of the few short stories of Robinson's as of late -- he mostly concentrates on novels; see the list of short stories here. This publication is like a 2005 one-page story, "Prometheus Unbound, At Last", which was published in a magazine (Nature) and not in a "conventional" SF&F magazine or collection. The image by Wesley Allsbrook used to promote the story, the bronze bull at Manhattan covered in moss, algae and all kinds of growing things, could be seen as a teaser to Kim Stanley Robinson's next novel coming in 2016! It will take place in a future with severe climate change and sea level rise, in a Venice-like half-submerged Manhattan. Stay tuned for more, and merry post-solstice festivities!